The 1995 European Grand Prix (formally the XL Grand Prix of Europe) was a Formula One motor race held on 1 October 1995 at the Nürburgring, Nürburg, Germany. It was the fourteenth race of the 1995 FIA Formula One World Championship and the first to be held there since 1985. The 67-lap race was won by Michael Schumacher for the Benetton team after starting from third position. Jean Alesi finished second in a Ferrari, with David Coulthard, who started the Grand Prix from pole position, third in a Williams car. This was also the last race for Massimiliano Papis and Jean-Denis Délétraz. Damon Hill, Coulthard's teammate, started the race in second, but dropped down to third behind Schumacher at the start. Hill remained behind Schumacher for the majority of the race, before losing his front wing in a collision with Alesi and dropping back due to the resultant pit stop. He then spun off the track on lap 58 when running in fourth position, leading to his retirement. Alesi looked set to win the race after starting the race with dry weather slick tyres on a damp track, but was held up in lapped traffic and overtaken by Schumacher two laps before the end of the race. Schumacher's win kept him at the top of the Drivers' Championship, 27 points ahead of Hill. The German driver only needed a further three points to secure the title. Benetton were now 20 points ahead of Williams in the Constructors' Championship following Schumacher's win. The race marked the return to the Formula One calendar for the Nürburgring track after being off the calendar since the 1985 season, due to commercial disputes off the circuit involving the circuit's promoters. Its return to the World Championship schedule was facilitated by a surge of interest in the sport throughout Germany as a result of Michael Schumacher's 1994 drivers' title. The previous year, the European round was held at the Circuito Permanente de Jerez in Spain, a late replacement for the cancelled Argentine Grand Prix. Heading into the 14th race of the season, Benetton driver Schumacher was leading the Drivers' Championship with 72 points, with Williams driver Damon Hill second on 55. Behind them were Hill's teammate David Coulthard on 39, Schumacher's teammate Johnny Herbert on 38, and Ferrari driver Jean Alesi on 34. In the Constructors' Championship, Benetton were leading with 100 points, with Williams second on 88 and Ferrari third on 62. There was one driver change heading into the race: Gabriele Tarquini replaced Ukyo Katayama at Tyrrell, the Japanese driver choosing not to race on doctors' advice following a crash at the Portuguese Grand Prix. Katayama had sustained a strained neck and bruising in the crash, in which his car had rolled several times following a startline collision with Luca Badoer's Minardi. Prior to the race weekend, Coulthard announced that he was moving to the McLaren team for the 1996 season. He had first signed a contract with McLaren in October 1994 before his full-time Williams drive for 1995 was confirmed, and his one-year deal with the latter was not renegotiated due to his McLaren commitment. McLaren also confirmed that Mika Häkkinen and Jan Magnussen would continue in their existing roles as race and test driver for the team respectively, leaving Mark Blundell without a contract for 1996. Coulthard's deal was officially confirmed on the day of the race itself. Meanwhile, Coulthard's prospective replacement, Jacques Villeneuve, had tested a Williams for the first time since being confirmed as Hill's teammate for 1996, running for two days at the Monza circuit. The Jordan team also announced that it would keep its driver pairing of Rubens Barrichello and Eddie Irvine for 1996 in the week before the race. However, Ferrari then announced that it had bought out Irvine's contract, and that he would be partnering Schumacher at the team for 1996. Jordan subsequently announced that Martin Brundle would move from the Ligier team to partner Barrichello instead. Some teams brought upgrades to the race – the Williams team used the upgraded "B" versions of the FW17 chassis for the second time, after its début at the previous race in Portugal. McLaren also brought upgrades to coincide with the home race of their engine supplier, Mercedes. The team opted to amalgamate the "B" and "C" versions of its troublesome MP4/10 chassis, with a rear end and gearbox from the former. In addition, the Ferrari team brought a revised rear wing and sidepods for its 412T2 car, which both drivers agreed to be an improvement. This was the first Formula One race to be held at the Nürburgring since the 1985 German Grand Prix, so an additional familiarisation session was held prior to the usual practice and qualifying sessions. In this session, Schumacher set a benchmark time of 1:20.418, from Hill, Coulthard, Häkkinen, Heinz-Harald Frentzen (Sauber), Gerhard Berger (Ferrari) and the rest of the field. The drivers, of whom only Berger and Brundle had raced at Nürburgring in a Formula One car before, were uninspired by the circuit: Schumacher described it as "dull" and "easy to learn, with no real challenges" and Coulthard predicted a processional race without much overtaking. Two practice sessions were held before the race; the first was held on Friday morning and the second on Saturday morning. Both sessions lasted 1 hour and 45 minutes with weather conditions dry in the first session, but wet for the second session. Hill set the fastest time in the first session, posting a lap of 1:19.343, three-hundredths of a second quicker than teammate Coulthard in second place. The Benettons were third and fifth fastest; Schumacher ahead of Herbert, with Ferrari driver Gerhard Berger fourth, over a second behind Hill. Häkkinen rounded out the top six in his McLaren. The wet conditions for the second practice session meant that lap times were slower as there was less grip on the track. Despite the wet conditions, Hill was again fastest with a time of 1:34.906. Coulthard was second, with Frentzen third in the Sauber, two seconds slower than Hill. The Ferraris were fourth and fifth, Berger in front of Alesi. Schumacher and Herbert were sixth and seventh respectively, with Barrichello eighth. Olivier Panis in the Ligier and Mika Salo in the Tyrrell rounded out the top ten, both three and a half seconds off the fastest lap time. Amongst the slower runners, Andrea Montermini suffered a worrying moment when his Pacific car shed its left-rear wheel, but he was able to return to his pit garage. 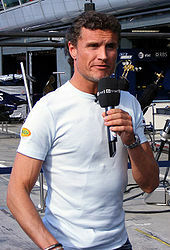 David Coulthard (pictured in 2007) took pole position in his Williams-Renault. The qualifying session was split into two one-hour sessions; the first was held on Friday afternoon and the second on Saturday afternoon. The fastest time from either session counted towards the drivers' final grid positions. Both sessions on Friday and Saturday were interrupted by rain, which led to little action on the track. Coulthard took his third consecutive pole position in his Williams, with a time of 1:18.738. He was joined on the front row by teammate Hill, who was two-tenths of a second behind. Schumacher was third in the Benetton, four-tenths of a second slower than Coulthard, despite lapping fastest in the second part of qualifying. The time he set in the second part of qualifying was still slower than Coulthard and Hill's time set in the first part, and thus he was third quickest overall. Behind the leading three, Berger was fourth with teammate Alesi in sixth. Eddie Irvine in the Jordan split them for fifth. Herbert and Frentzen shared the fourth row of the grid. Despite bringing car upgrades to the event, Häkkinen and Blundell could only qualify their McLarens ninth and tenth respectively. Tarquini qualified in nineteenth, four places behind teammate Salo, but admitted to feeling out-of-practice by Formula One standards. Several drivers went off in the difficult conditions, including Panis and Montermini. The former driver's crash was caused by a stuck throttle; the resultant damage to the car forced him to switch to the team's spare monocoque. The conditions during the first session were generally faster, with seventeen of the 24 drivers setting their fastest qualifying times in this period. I'm getting rather tired of questions about team orders. I think what everyone wants to see is a motor race, and my first duty to the team is to try and win the constructors' championship. If the circumstances were different, like they were last year [when Coulthard did not compete in all of the races], I would think it entirely fair to do as the team requested [...] But I also think it's fair of Williams not to ask me to slow down if I'm quicker than Damon." Following the session, Barrichello and Footwork driver Massimiliano Papis revealed that they expected to fail routine drugs tests they had just taken, as both had been taking decongestants, for nasal problems and a cold respectively, which contained the banned substance ephedrine. On Saturday, the team principals also met to discuss future changes to the sport: it was agreed that qualifying would be reduced to a single hour-long session for the 1996 season, and a reduction from seventeen to sixteen Grands Prix was confirmed. The track surface for the start was damp, but dried up as the race progressed. The drivers were scheduled to go onto the track at 09:30 CET (GMT +1) for a 30-minute warm-up session, however the session was delayed until 10:05 CET due to fog and heavy rain. Several drivers went off the track during the session due to the wet weather conditions. Both Williams cars maintained their good performance from qualifying; Coulthard had the fastest time of 1:38.378. Hill was third in the other Williams; Berger split them in the Ferrari for second position. Schumacher completed the top four, six-tenths of a second behind Coulthard. Approximately 90,000 spectators attended the circuit on race day. Coulthard was forced to use his spare car, set up for Hill, for the race itself after he spun off the track during his reconnaissance lap, stalling the engine in the process. The race was scheduled to start at 14:00 CET, but Papis stalled his Footwork in the starting lights procedure, resulting in the start being aborted. A new start time of 14:05 CET was planned. Many of the teams started the race with wet weather tyres, but the Ferrari and McLaren teams chose to fit their cars with dry weather slick tyres. The Ferrari mechanics also raised the ride height and increased the downforce levels on Alesi and Berger's cars on the grid, making them more competitive in the wet conditions. Coulthard, from pole position, held onto the lead into the first corner, while Hill made a bad start and was overtaken by Schumacher in the run down to the corner. Irvine also got past Hill, but was repassed by the Williams driver later on in the opening lap. Further down the order, Frentzen was judged to have jumped the start, while Papis took up his normal grid position instead of starting from the back as he should have done after stalling; both were given ten-second stop-and-go penalties in the early stages of the race for these misdemeanours. Papis' teammate, Taki Inoue, failed to take the start due to an electronic failure. "It was so pathetic that I just sat there driving along laughing out loud beneath my helmet." Mark Blundell, commenting on his race. The McLarens and Berger's Ferrari slipped back in the early laps of the race, with both McLarens overtaken by the Pacific and Forti cars as they dropped down the order. The McLaren chassis handled badly in the wet conditions, while the throttle response of the Mercedes engine was also too abrupt to be driven effectively in the rain. Berger dropped to ninth, not helped by an incorrectly pressured set of tyres that left him with a handling imbalance, but Alesi moved up to fourth position, overtaking Herbert on lap five and Irvine on lap eight. Berger and the McLarens moved back up the order as drivers made a pit stop for slick tyres. As the front-runners made their stops, Alesi ended up twenty seconds ahead of Coulthard, Schumacher and Hill. By the end of lap 17, most of the drivers had pitted for slick tyres, and the running order had stabilised as Alesi, Coulthard, Schumacher, Hill, Berger and Irvine occupied the top six positions. Frentzen was outside the points in seventh, but on the next lap he collided with Pedro Diniz's Forti while trying to lap him, retiring from the race as a result. Panis and Blundell were also out by this stage, both having spun off the track on lap 15. Near the front of the field, Hill was faster than third-placed Schumacher and began to catch him. Schumacher defended his position vigorously several times, but Hill eventually passed him. However, Hill then ran wide at the final corner and Schumacher repassed him. Coulthard, in the other Williams, began to suffer from excessive oversteer with his car's handling, dropping to fourth behind Schumacher and Hill, who passed him on laps 21 and 23 respectively. As Schumacher and the Williams drivers battled for position, Alesi was able to extend his lead to 45 seconds. Alesi and Schumacher made their second pit stops on lap 34; Alesi took on enough fuel to finish the race, while Schumacher's was the second of three scheduled pit visits. Alesi exited from his stop just in front of third-placed Hill, who attempted to overtake Alesi on lap 40, the lap before his own pit stop was due to take place. In the process, the two cars made contact and Hill lost his front wing. As a result, he had had to pit to replace the damaged wing, losing time while driving around the track with his damaged car and rejoining behind Coulthard in fourth position. On the same lap, Berger retired with terminal engine problems. After his stop, Hill pushed hard in an attempt to catch Coulthard, but spun out of the race on lap 58. The impact with the tyre barrier was hard enough to cause a minor crack to a bone in his leg, but he escaped serious injury. Michael Schumacher (pictured in 1994) won the race by 2.6 seconds. Schumacher made his final pit stop on lap 52 from second place, having caught up with Alesi during his third stint. He rejoined some distance behind the Ferrari, but began charging, setting a fastest lap of 1:21.180 on lap 58, almost 1.7 seconds faster than Alesi's fastest lap of the race. Alesi's attempts to keep the lead were not helped by lapped traffic getting in his way, as well as losing five seconds at the Veedol chicane by running wide onto the gravel. In the closing laps, Schumacher caught Alesi, overtaking him on the outside of the chicane on lap 65. Schumacher opened the gap to two and a half seconds, and won the race after 67 laps to secure his seventh victory of the season in a time of 1:39:59.044. Hill, watching from the side of the track, applauded Schumacher's win; the German attempted to stop his car to give his rival a lift back to the pits, but was unable due to a slipping clutch. Alesi held position to finish second in his Ferrari, with Coulthard third, 35 seconds behind. Completing the points-scorers, Barrichello finished fourth, ahead of Herbert and Irvine. The latter two had battled for much of the race: they collided on lap 31, dropping both behind Barrichello and causing Herbert to make a pit stop for a new front wing; later, Irvine spun while attempting to lap Papis, allowing Herbert back through. Outside the points, Brundle finished seventh for Ligier, ahead of the recovering Häkkinen, whose eighth position, two laps down on Schumacher, was a major disappointment for Mercedes in its home country. Minardi drivers Pedro Lamy and Luca Badoer finished ninth and eleventh, with Salo in tenth position, the latter making an unscheduled pit stop to change a punctured tyre after colliding with Jean-Christophe Boullion during the race; the Sauber driver retired as a result of damage sustained in this incident. Papis, Diniz, Tarquini and Délétraz completed the field. Of the other retirements, Roberto Moreno stopped his Forti with a driveshaft failure, while Montermini endured a fraught pitstop on lap 42. The Pacific team's fuel rig malfunctioned, and, in the confusion, refueller Paul Summerfield sustained a fractured left femur when he was hit by the car as it left its pit box. Montermini consequently ran out of fuel on lap 45. "Today, I decided not to risk starting on slicks because the car felt so critical in these conditions and I wanted to play safe for the championship. When I saw Damon in the wall, I thought that now I had to decide to stay in second place or to push to win and my fans pushed me to try and win the race. When I passed Jean, he was making it as difficult as possible, but there was nothing dangerous or anything. He left room on the outside and we did touch. For me, it is fantastic to win the German Grand Prix, the Belgian Grand Prix and the Monaco Grand Prix [this year] as well as this race in Germany. All four are 'home' events for me and I have been very lucky." Michael Schumacher, commenting on the race. Journalist Alan Henry described the race as the best of the season so far, even of recent memory, and suggested that Schumacher's performance could mark a watershed in which the German "crossed that indistinct dividing line separating the good from the great". Schumacher's win meant he needed only three more points from the remaining races of the season to win the Drivers' Championship, while Hill would have to win all three Grands Prix, effectively meaning that the Championship was over. Damon has to do two things. First, he has to establish himself as the No. 1 at Williams for next year so the team can give him their full support. Second, he has to re-establish himself as a racer. Maybe he needs to lose a front wheel once or twice to re-establish himself. Schumacher said that Hill made "half-hearted attempts" to overtake during the race, which led to him "getting into trouble". Alesi also blamed Hill for their collision, saying that "I do not know what happened with Damon. I saw his nose alongside me, that's all. I was sideways [turning into the corner] and he hit me. He was too optimistic as normally you cannot do anything at that corner." At a Fédération Internationale de l'Automobile (FIA) World Motor Sport Council meeting on October 19 to discuss driver etiquette, they opted against introducing new rules on the issue. Formula One's governing body emphasised that the International Sporting Code would be enforced on the basis that drivers are free to drive as they wish "provided they do not deliberately endanger another driver or repeatedly obstruct him on a straight", following incidents during the year involving Hill and Schumacher. Alesi, despite his performance in the early stages of the race, was also criticised by some for losing his lead after letting Schumacher gain time on him in the final laps. Ferrari designer John Barnard later blamed Alesi's hesitance in lapped traffic for the loss of time, the rate of which Henry described as "inexplicable". Alesi blamed his inability to fend off Schumacher on his worn tyres, which had completed half a race distance as opposed to Schumacher's fresher set, and on being held up by Häkkinen and Brundle's battle for seventh position in the closing laps. Alesi was also given the instruction to save fuel with 15 laps to go, suggesting that his one-stop strategy was the incorrect choice. On 2 November 1995, the FIA announced that none of the drivers who took part in the anti-doping tests at the Portuguese and European Grands Prix had tested positive, including Barrichello and Papis. However, FIA Formula One Safety and Medical Delegate, Professor Sid Watkins, subsequently argued that as ephedrine had no effect on a driver's ability, the sport should not use exactly the same list as the International Olympic Committee (IOC) in any case. ^ a b c d e f g h i j k l m n o p q r s t u v w Henry, Alan (December 1995) . "1995 Grands Prix: Grand Prix of Europe". Autocourse 1995-96. Hazleton Publishing. pp. 206–207. ISBN 1-874557-36-5. ^ a b "1995 European Grand Prix". formula1.com. Archived from the original on 2 November 2014. Retrieved 24 December 2015. ^ a b FIA Formula 1 World Championship – 1995 Season Review (VHS). Duke Video. 1995-12-11. Event occurs at 2:17:30–2:26:00. EAN-13 5 017559 034955. Retrieved 2008-08-20. ^ "Champion in all but name". GrandPrix.com. Inside F1. 16 October 1995. Retrieved 26 April 2008. ^ "What you may not know about the Nurburgring". GrandPrix.com. Inside F1. 25 September 1995. Retrieved 24 January 2009. ^ a b Domenjoz, Luc (1995). "The 17 Grand Prix - Grand Prix of Europe". Formula 1 Yearbook 1995. Chronosports Editeur. p. 190. ISBN 2-940125-06-6. ^ Neilan, Terence (1994-08-28). "Q and A". The New York Times. The New York Times Company. Retrieved 2009-06-02. ^ a b Henry, Alan (December 1995) . "1995 Grands Prix: Portuguese Grand Prix". Autocourse 1995-96. Hazleton Publishing. pp. 198–199. ISBN 1-874557-36-5. ^ "Tyrrell drive up for grabs". GrandPrix.com. Inside F1. 2 October 1995. Retrieved 17 August 2008. ^ Henry, Alan (December 1995) . "1995 Grands Prix: Portuguese Grand Prix". Autocourse 1995-96. Hazleton Publishing. p. 194. ISBN 1-874557-36-5. ^ a b c d e f g h i j k l m n Henry, Alan (December 1995) . "1995 Grands Prix: Grand Prix of Europe". Autocourse 1995-96. Hazleton Publishing. p. 205. ISBN 1-874557-36-5. ^ a b c d e f g Henry, Alan (December 1995) . "1995 Grands Prix: Grand Prix of Europe". Autocourse 1995-96. Hazleton Publishing. p. 201. ISBN 1-874557-36-5. ^ "Villeneuve in action". GrandPrix.com. Inside F1. 25 September 1995. Retrieved 11 April 2009. ^ "Jordan confirms Eddie and Rubens". GrandPrix.com. Inside F1. 25 September 1995. Retrieved 11 April 2009. ^ "Irvine to Ferrari!". GrandPrix.com. Inside F1. 2 October 1995. Retrieved 11 April 2009. ^ "And Brundle goes to Jordan". GrandPrix.com. Inside F1. 2 October 1995. Retrieved 11 April 2009. ^ a b c d e f g h i Henry, Alan (December 1995) . "1995 Grands Prix: Grand Prix of Europe". Autocourse 1995-96. Hazleton Publishing. p. 204. ISBN 1-874557-36-5. ^ "1995, Europe: Familiarisation". Forix. Autosport. Retrieved 2009-04-01. ^ a b "European Grand Prix - 95". Gale Force F1. Archived from the original on 12 August 2006. Retrieved 19 January 2009. ^ "European Grand Prix: 2nd Free Practice". Gale Force F1. Archived from the original on 20 October 2006. Retrieved 19 January 2009. ^ "Tyres". The Official Formula 1 Website. Archived from the original on 18 January 2009. Retrieved 19 January 2009. ^ Domenjoz, Luc (1995). "The 17 Grand Prix - Grand Prix of Europe". Formula 1 Yearbook 1995. Chronosports Editeur. pp. 188–189. ISBN 2-940125-06-6. ^ "European Grand Prix: 2nd Qualifying". Gale Force F1. Archived from the original on 20 October 2006. Retrieved 31 January 2009. ^ "1995 > Coulthard, David". The Official Formula 1 Website. Archived from the original on 20 January 2009. Retrieved 31 January 2009. ^ "European Grand Prix: The Grid". Gale Force F1. Archived from the original on 20 October 2006. Retrieved 31 January 2009. ^ "European Grand Prix: 1st Qualifying". Gale Force F1. Archived from the original on 2006-10-20. Retrieved 2009-02-05. ^ European Grand Prix: 2nd Qualifying Session Live (Television production). London, England: Eurosport. 30 September 1995. Event occurs at 35:00–37:00 (excluding commercials). ^ Henry, Alan (December 1995) . "1995 Grands Prix: Grand Prix of Europe". Autocourse 1995-96. Hazleton Publishing. pp. 201, 204. ISBN 1-874557-36-5. ^ "Changing the fabric of Formula 1". GrandPrix.com. Inside F1. 1995-10-02. Retrieved 2009-04-11. ^ a b c "Europe 1995 - Schumacher shines". The Official Formula 1 Website. 2003-06-25. Retrieved 2009-03-02. ^ "European Grand Prix: Warm Up". Gale Force F1. Archived from the original on 2006-10-20. Retrieved 2009-01-23. ^ a b c d e f g Domenjoz, Luc (1995). "The 17 Grand Prix - Grand Prix of Europe". Formula 1 Yearbook 1995. Chronosports Editeur. p. 187. ISBN 2-940125-06-6. ^ Dodgins, Tony; Benson, Andrew (5 October 1995). "European GP: F1 team by team". Autosport. Vol. 141 no. 1. pp. 42, 44. ^ a b c d e f g h i j "Grand Prix Results: European GP, 1995". GrandPrix.com. Inside F1. Retrieved 27 January 2009. ^ "Stewards' Decision No. 3". Forix. Autosport. Retrieved 2009-04-11. ^ "Stewards' Decision No. 2". Forix. Autosport. Retrieved 2009-04-11. ^ a b Henry, Alan (8 July 2002). "McLaren slide into the depths". The Guardian. Guardian News and Media. Retrieved 27 February 2009. ^ "1995, Europe: 4 Mika Salo". Forix. Autosport. Retrieved 2009-04-11. ^ "Grand Prix Mechanics Charitable Trust - The Trust in Action". Archived from the original on 2012-03-25. Retrieved 2011-06-08. ^ "1995, Europe: 1 Michael Schumacher". Forix. Autosport. Retrieved 2009-04-11. ^ Walker, Murray (Commentator) (1995-10-22). Grand Prix: Pacific (Television production). London, England: BBC. Event occurs at 24:00–24:30. Damon Hill has had a lot of criticism for not being "forceful" enough, well it's a very different point of view from inside the cockpit. ^ a b Henry, Alan (December 1995) . "1995 Grands Prix: Pacific Grand Prix". Autocourse 1995-96. Hazleton Publishing. p. 209. ISBN 1-874557-36-5. ^ Holt, Oliver (1995-10-20). "Hill under fire for conceding championship - Motor Racing". The Times. London, England: Times Newspapers. ^ Henry, Alan (December 1995) . "1995 Grands Prix: Pacific Grand Prix". Autocourse 1995-96. Hazleton Publishing. p. 211. ISBN 1-874557-36-5. ^ Henry, Alan (December 1995) . "Formula 1 Review: Ferrari". Autocourse 1995-96. Hazleton Publishing. p. 79. ISBN 1-874557-36-5. ^ Chiavegato, Christiano (1995). "Background - View From Italy: Ferrari in the Waiting". Formula 1 Yearbook 1995. Chronosports Editeur. pp. 54–55. ISBN 2-940125-06-6. ^ "Anti-Doping Tests - Formula One" (PDF). Fédération Internationale de l'Automobile. Archived from the original (PDF) on 2011-06-04. Retrieved 11 April 2009. ^ Saward, Joe (1 August 1999). "Formula 1 and crime". GrandPrix.com. Inside F1. Archived from the original on 2008-11-19. Retrieved 11 April 2009. ^ a b "Europe 1995 - Championship • STATS F1". www.statsf1.com. Retrieved 15 March 2019.